11:00 AM Race ends, swimmers that are still in the water will be assisted off the course. 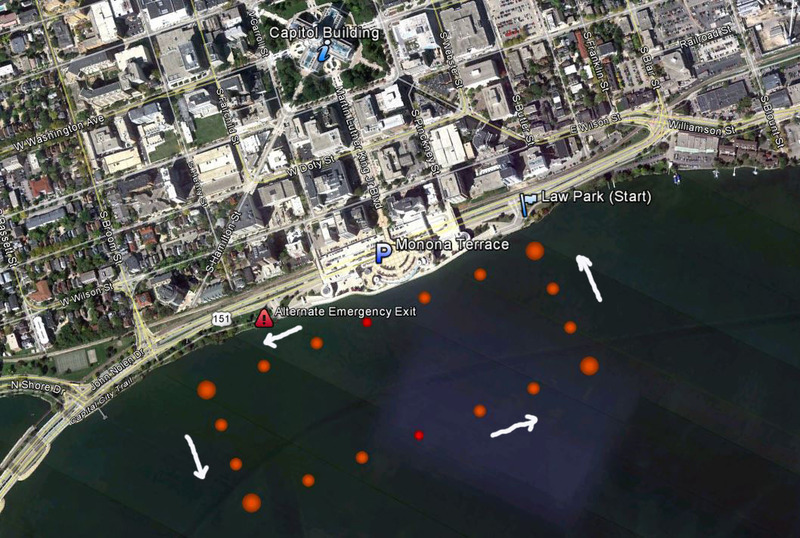 Madison & Dane County Public Health has beach information, including algae and bacteria alerts and levels. Law Park is between BB Clark Beach and Olin Beach on Lake Monona. For swimmer safety, wet suits are not allowed if the water temperature exceeds 78 degrees F.
All swimmers are required to check in, pick up their ankle chip for timing, get your t–shirt if you pre-paid for one, and smile before the race starts. It may be helpful to bring a printed confirmation receipt of your registration just in case you are not on the list...it happens. Check–in opens at 7:00 AM, and will close by 8:10 AM. A mandatory (yes, MANDATORY) race talk will be at 8:15 where we describe the course, any hazards, safety, etc. Race waves start at 8:30 AM. Due to staffing and liability issues, we do not offer a gear check for swimmers. This is a public park and any bags or gear left unattended will not be watched. Please leave all your valuables in the car or with someone you trust. We will have 2 small changing tents available for swimmers to put on and take off their swim suits. Food and beverages will be provided after finishing the event. Please bring any snacks or water you may want before the race starts. The Madison Open Water Swim will be started and contested in three waves. The 1st wave will be swimmers without wetsuits competing in the 2.4 mile event. These swimmers must finish within 140 minutes (2 hours and 20 minutes). The 1st wave will also be swimmers competing in the 1.2–mile event. Both wetsuit and non–wetsuit swimmers will be combined in this race. Swimmers must finish within 70 minutes (1 hour and 10 minutes). The 2nd wave will be swimmers with wetsuits competing in the 2.4 mile event. These swimmers must also finish within 140 minutes (2 hours and 20 minutes). The course poctured below is a 1.2–mile rectangle with 18 buoys to guide swimmers. The course is swum in a counterclockwise direction and is be marked by larger orange buoys at the four corners, smaller buoys on the straight legs with 2 smaller red buoys marking half way on the long length. Each buoy is approximately 100 yards apart. Swimmers in the first two waves will complete two laps of the course. Those in the third wave will complete a single lap. Participants will begin in the water at Law Park and swim counterclockwise on the outside of the orange buoys. The finish line is on shore marked by 2 large banners. Lifeguards and kayakers are spread along the course. If swimmers need assistance, please signal the nearest kayaker or life guard. If the race must be called due to safety considerations during the swim, an air–horn will sound with three (3) long blasts. Swimmers need to immediately swim to and exit the water either at the point where they entered the water or a secondary exit near the first turn buoy. The secondary exit point is marked on the course map. Kayakers and emergency evacuation powerboats will assist in the evacuation. Swimmers must be in attendance at the time of the award ceremony to receive an award. Awards will not be mailed to participants after the event, although you may designate someone to pick up an award for you. Awards will not be available until the conclusion of the event. Awards will be given for each age group only after the event is over. Age groups will be 18–24, 25–29, 30–34 . . . (continuing in 5 year increments). Awards will also be separated into wetsuit and non–wetsuit categories for each age group. There will be no refunds if the event is cancelled.